At 50 pages in (out of 353), I’m enjoying it but wondering if it will sustain my interest. On one level it looks like a modern variant of the haunted-house story; the title is from Edith Wharton’s phrase “a house with supernatural enhancements.” On another it’s a formal exercise: a clever–perhaps too clever?–mishmash of letters, diary entries, transcripts of security-camera footage, and so on. That mixed-media, semi-epistolary structure and the eerie-house setting recall Mark Z. Danielewski’s 2000 novel House of Leaves, which I loved, so I am going to keep on with this one, despite already being a bit tired of one of the two main characters. (The other one is growing on me, so they balance out.) And I’ve gotta say that, post-Shining, if you put a hedge maze next to a huge spooky building, something damned original better happen in that hedge maze. I’ll let you know. This entry was posted in Reading, Reviews, Uncategorized and tagged Reading, Reviews on November 4, 2014 by Rebecca Stefoff. The late, great S.J. Perelman wrote a series of marvelous essays under the rubric “Cloudland Revisited,” in which he reread books or rescreened movies he’d loved as a child or young man. His reactions to revisiting these cherished icons often surprised him. You can do no better than to look up a few of these pieces–I’m especially fond of “It Takes Two to Tango, But Only One to Squirm,” which recounts the experience of watching The Four Horsemen of the Apocalypse after many years. Just last week, courtesy of Interlibrary Loan, I revisited a puffy little cloud of my own. After discovering sf in the 5th grade I tore through every science-fiction book in my school library. 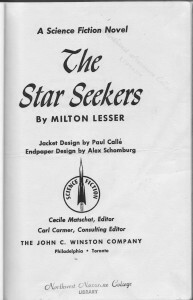 One was The Star Seekers, by Milton Lesser (the sf pen name of Stephen Marlowe, who wrote mysteries). I may have read it twice, because a few scenes remained vivid. It was my first exposure to the gen-ship premise: the story of a young man who sets out to explore his world, only to learn that his world is not what he thinks it is. So I picked up the book at my branch library, poured myself a foaming flagon of Diet Mountain Dew, and set out to tread once more the path followed by young Mikal, the hero. Turns out I had remembered the Hero’s Journey pretty accurately but forgotten a lot of tedious stuff, such as the author’s frequent scorn-heaping on candy, soda, and TV. (He didn’t say anything about Diet Dew.) Nor had I realized as a kid that the “science” part of this particular science fiction novel is pretty shaky. The Star Seekers didn’t hold up as well as other early favorites that I still love, including Jack Vance’s Vandals of the Void and Dan Wickenden’s The Amazing Vacation. Still, it was fun to read it again, and thanks to Interlibrary Loan I didn’t have to pony up $75 to buy it online. This entry was posted in Reading, Specfic and tagged Reading, Specfic on October 29, 2011 by Rebecca Stefoff. If you’ve read HPL’s “Supernatural Horror in Literature” you’ve seen his remarks on, say, Edward Lucas White’s story “Lukundoo.” If you then thought, Hey, I’d like to read that story, and googled it, you probably wound up at HorrorMasters, a site with a vast library of classic horror, novels as well as short fiction, all free, readable online or downloadable. There’s new fiction, too, but for me the best thing about the site is the availability of hundreds of older works, including many that cannot be found at Project Gutenberg or Google Books. It’s a priceless resource. If you haven’t checked out HorrorMasters, give it a try. “Lukundoo” isn’t a bad place to start. This entry was posted in Lovecraft, Reading and tagged Lovecraft, Writing on December 31, 2010 by Rebecca Stefoff.